In a big southern city like Austin, there are endless choices and types of food to indulge in, but it is not always easy to be decisive....that is where the South Austin Trailer Park Eatery comes in offering fab food and fun for a memorable meal out! With a unique atmosphere of outdoor casual dining - it really caters to everyone's needs. The lot was once home to a trailer park, and they cleared the lot for parking and food benches, but they left two old trailers which they renovated into a unique indoor eatery where you can escape the weather. They have a very popular and renowned food truck featured within their renovated trailer park lot, Torchy's Tacos, where they offer a wide variety of taco meats, such as ahi tuna, coconut shrimp, pulled pork and chicken, and they are all served inside a homemade corn shell with a variety of unique toppings (and lots and lots of avocado)! I highly recommend their queso, as it is the best I have ever had with a special blend of cheeses and peppers! The park also features options for the sweet tooth, Holy Cacao is a local favorite known as frozen "hot" chocolate, as well as cake flavored shakes and iced coffees all within the South Austin Trailer Park & Eatery, offering fab food and fun, sure to please everyone in your group! If you're looking to eat something on the healthy side, the truck called Conscious Cravings offers a variety of smoothies such as spinach, carrot, and mixed berry; as well as salads and fresh wraps. 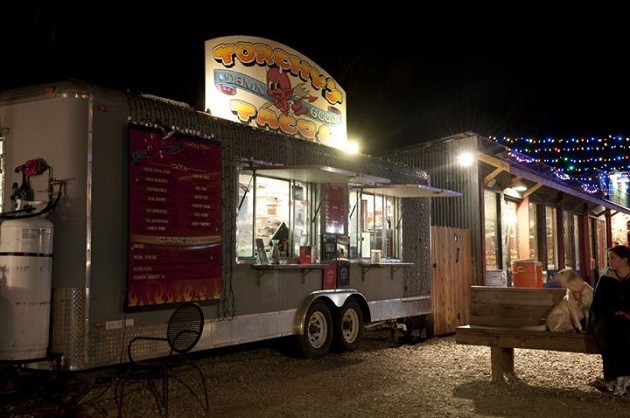 So if you're just visting or a local and you want to have a variety of options to choose from, all with a hipster feel, definitely try the South Austin Trailer Park & Eatery, and especially Torchy's Tacos if you want some damn good tacos. The whole experience is fun and offers a memorable night out! Connect with 512area for more restaurants in Austin. Your subscription is always free and you'll never miss out on all the great things to do in Austin!